Event organisers have been given eight weeks to bid to operate two of the future Queen Elizabeth Olympic Park venues, the Aquatics Centre and the Multi-Use Arena after the Games. The Olympic site operator, which recently announced it was looking for post-Games operator for the Arcelor Mittal Orbit venue, also release further details on the two Olympic sites. 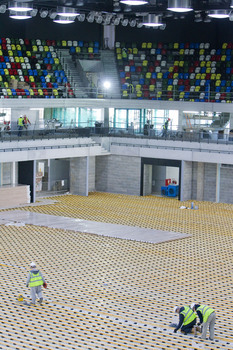 The Aquatics Centre features two 50m pools and a diving pool and seating for 2,500 people which can be extended to 3,500. It is expected to attract up to 800,000 people a year. 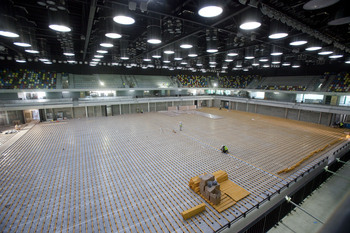 The Multi-Use Arena, which features retractable seating, will provide sporting, entertainment, cultural, community and business events. There is also the potential for a health and fitness centre. The operators will be appointed by January 2012 so they can work with the building’s Games-time operations and manage their Games and post-Games fit out. It is anticipated that the contracts will run for ten years. Organisations will also have the opportunity to bid for contracts to maintain the future Queen Elizabeth Olympic Park. From today (26 January), estates facility management services including park maintenance, horticultural, waste management and security are also being put out for EOI. Andrew Altman, Chief Executive of the Olympic Park Legacy Company, said: "The Aquatics Centre and the Multi-Use Arena will be core to the Queen Elizabeth Olympic Park, with families, community groups and athletes taking part in sport and entertainment events under the same roof. "They will be real community assets and we are looking for the right operators who can bring people together and improve health, education and lifelong participation in sport." The Multi-Use Arena is expected to reopen in mid 2013. The building is covered with over 3,000 sq m of external copper cladding. The Zaha Hadid-designed Aquatics Centre is expected to reopen in January 2014. Venue operators will be subject to some National Governing Bodies of Sport duties. The deadline for applicants is Wednesday 23 March 2011.